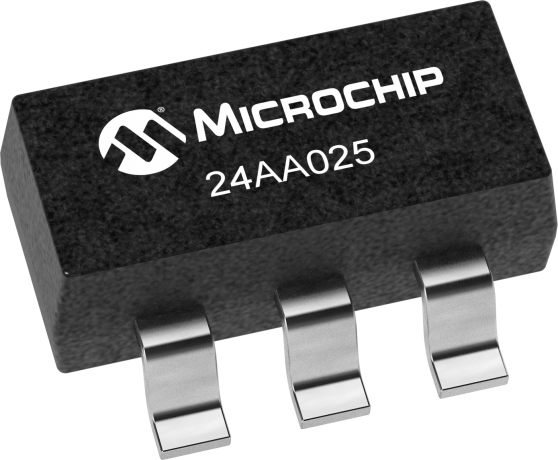 The Microchip Technology Inc. 24AA025 is a 2Kb Serial EEPROM with a voltage range of 1.7V to 5.5V. The device is organized as a single block of 256 x 8-bit memory with a 2-wire serial interface. Low current design permits operation with typical standby and active currents of only 1 µA and 1 mA, respectively. The device has a page write capability for up to 16 bytes of data. Functional address lines allow the connection of up to eight 24AA025 devices on the same bus for up to 16K bits of contiguous EEPROM memory. The device is available in the standard 8-pin PDIP, 8-pin SOIC (3.90 mm), TSSOP, 2x3 DFN and TDFN and MSOP packages.